What is an Appropriate Membership Goal for Our Association? How much should your association membership grow in a year? 3%? 5%? More? Less? What are your trends? How much has the association grown over the past 3-5 years? Has that trend been consistent? Or has your association’s growth fluctuated significantly? Regardless of whether you are happy with past trends, they will usually form the starting point for your membership goal calculation. this year. Of course, you’ll also want to ask them what their membership development plans and programs are; they should be happy to share ideas with you unless you are a competitor. If your association is national/international, find non-competitors that serve similar audiences and ask them about their trends. What is your board expecting? Are they asking for aggressive growth? If so, that’s fine, but you will also need to know where this goal ranks against all of the other association priorities. If your board wants aggressive growth, and it’s a high priority, they should also be willing to give you the resources to get the job done. If your board wants aggressive growth, but this is a lower-priority goal (meaning you’ll get few resources), ask for either a lower goal or more resources up front. It’s better to negotiate with your board now from a position of principles than later from a position of desperation. How has your association’s membership retention level been looking? If retention is weak (e.g. less than 75%), then work on fixing retention and your membership levels may fix themselves without a major membership push. If retention is high (e.g. greater than 90%), then you have a great story to take to prospective members – you simply need to get the word out. If your retention levels are in between, then you’ll need to work on both areas, with retention getting the greater emphasis. How are your association membership demographics trending, and how do those compare to the pool of prospective members? For example, if your association membership is getting older, and the prospect pool is shrinking, it will be difficult to grow as your members retire and there are fewer prospects available. If your association membership is maintaining its age distribution and the pool of prospects is growing, then you have more room to set an aggressive goal. There are many considerations when setting your association membership goal, but the items listed above will give you a great start. *The views and opinions expressed in this article are those of the authors and do not necessarily reflect the official policy or position of the Indiana Soceity of Association Executives (ISAE). Segmentation: Who is Hiding in Your Member Database? Every association has a variety of member segments; and each segment may have different needs. More than likely, these segments are identified in your membership database: member type, primary reason for joining, tenure in profession, gender, geography or if applicable local chapter affiliation. This information gives every association a starting point for strategic planning, program and benefits development. 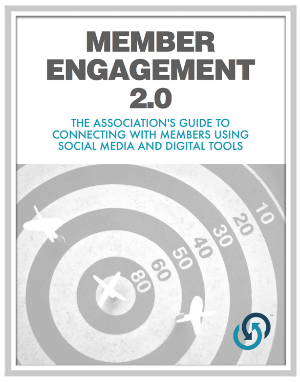 Once identified, association leadership can determine the size of the segment (both within the current membership base and pool of prospective and lapsed members.) Leadership will then need to assess if the association has the resources in place to meet the needs of the newly discovered segment. What is happening in the industry? How will industry changes impact this new segment as well as the association overall? Is the industry growing or contracting? How will that impact the size and viability of the segment? Can this new segment drive membership growth? Or, are there other organizations already serving the needs of this segment? If the newly discovered segment has legs (numbers that are too large to ignore with good growth potential), be sure to add this segment into your member database – perhaps as a special interest group (SIG) and include it on your membership and renewal applications for future identification and targeted communications. This will allow you to further assess interest level and growth potential for this segment. It will also enable you to engage these members in program development. Author: Tracie Mrakich is a member of ASAE, ISAE, Association Forum of Chicagoland and the American Marketing Association (AMA). She is a past-president of the Indianapolis Chapter of the AMA (INDY AMA) and currently serves on the membership committee of the Indiana Society of Association Executives (ISAE). everyone either wants to hear more about it or is already tired of it. Social media is a great way to communicate. The technology allows us to stay in touch with people from all over the world and share information, media and content. How often should your association introduce new association membership benefits? This is a critical question as you allocate resources, both financial and staff time. Introducing new benefits too frequently can actually have a detrimental effect because each introduction will have less impact and potentially be more confusing due to the large amount of marketing “chatter” coming from your association. Given this, a good rule of thumb would suggest that between one and four new association member benefits per year may work well. 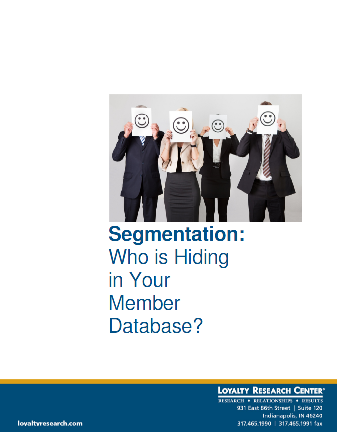 [White Paper] Segmentation: Who is Hiding in Your Member Database? Every association has a variety of member segments; and each segment may have different needs. More than likely, these segments are identified in your membership database: member type, primary reason for joining, tenure in profession, gender, geography or if applicable local chapter affiliation. This information gives every association a starting point for strategic planning, program and benefits development. View the full white paper here. Where is YOUR Association? – The Next Steps for Advancing the Value Your Members Want. The South attacked from the north. And the North attacked from the south.